We were prepared to testify at the state Senate hearings on Atlantic Yards which Senator Bill Perkins was holding at Pratt. We were called by the senator’s office the night be before to inform us that we might, or might not, be called upon to testify; they knew they were going to have a very full afternoon. We didn’t supply oral testimony but this will supply you with the written testimony we turned in. To say that the hearings were chaotic would be an understatement. 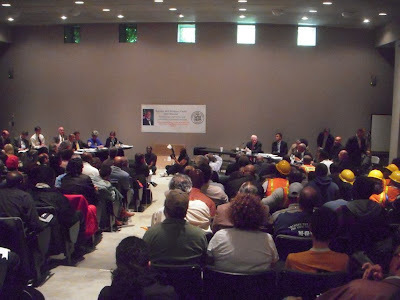 As commented upon at the hearing’s conclusion, much of it was characterized by people who attended (including two senators, Carl Kruger and Marty Golden, who sort of crashed the event) for the purpose of intentionally showing disrespect to the proceedings and who exhibited open hostility toward any legislative inquisitiveness about the vast resources going into Atlantic Yards or about what Forest City Ratner is expected to produce in return. This meant that throughout much of the afternoon men dressed like construction workers with hard hats and red mesh Day-Glo caution vests were standing up to shout and use steel whistles to drown out and/or indicate their opinion on what was happening. Senator Perkins did not ask security to enforce order and the disruptions were tolerated except for an occasional request for more respect or to tone things down. 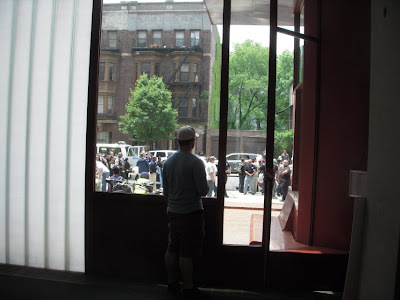 While the men looked like construction workers it may be that, rather than being supplied by the unions as so often happens, they were instead supplied by BUILD, the Ratner-created and financially supported Astroturf organization. 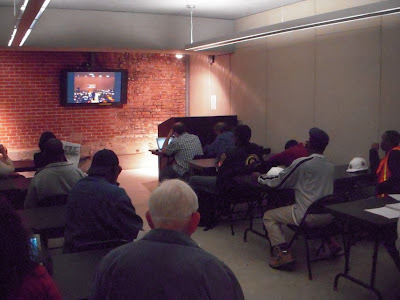 * The best indication of this was that while there were several people who spoke on favor of proceeding with Atlantic Yards (or whatever the megaproject turns out to be), the caution-vested fellows where particularly emphatic about applauding the testimony of two individuals testifying who were actually from BUILD. The hard-hatted men were apparently on the clock. We noted that when one of their number inquired of someone else who seemed to be in charge whether it would be OK to leave, the other responded by holding up five fingers. From this we interpreted that they were committed to stay until 5:00 PM. That assessment seemed to be spot on when, at two minutes of 5:00, the entire group stood up and then exited the doors at exactly 5:00. A brief meeting of some of the members of this group outside the auditorium doors ensued, after which a few of them straggled back in, but after that it was considerably more quiet. At one point earlier on we asked one of these men whether he didn’t think that, if so much effort had not gone into piling so many resources and so much benefit onto this single Ratner project, the public resources would have been distributed amongst a lot of projects throughout Brooklyn (including building in the Atlantic Yards/Vanderbilt Yards area) that would already be happening and providing good jobs. He was starting to agree that a huge amount of benefit was being piled onto Ratne,r saying something like “cause he’s the guy who got it” and then when he heard me use the word “disproportionate” halted himself and said that I shouldn’t be asking trick questions and that it wasn’t fair to be recording what he was saying. 2. Ratner is in line to be significantly financially accommodated by the government agencies involved and required to pay less than previously specified for the rights they will bestow upon him. 3. The agencies are quite likely going to be allowing Forest City Ratner substantial time to dawdle over the “decades” with respect to providing any public benefit. It seems that about the only thing that will be expected of FCR is that FCR benefit itself by getting a Nets arena underway in some form before the end of the year. The agencies are apparently willing to allow that no housing would be immediately built to go with the arena and the agencies are also willing to accommodate the idea that the first housing, as and when it would ever be built, would be front-loaded with a higher proportion of luxury and market-rate housing units. In other words, the public agencies, presumably under the direction of Mayor Bloomberg and Governor Paterson to whom they are respectively accountable, seem content to let all of these things slide in the direction of further, even more disproportionate benefit to Forest City Ratner. Our testimony was about how Forest City Ratner has already piled too much benefit upon itself to the detriment of its neighbors and the general public. In terms of an inappropriate piling on of benefit to Forest City Ratner, our testimony was similarly themed to testimony delivered by Pratt urban planning professor Ron Shiffman and the Fifth Avenue Committee’s Michelle de la Uz. (The Fifth Avenue Committee is an important and committed provider of affordable housing in Brooklyn.) Mr. Shiffman testified (and we agree) about how Atlantic Yards would not actually be providing affordable housing because it would be taking subsidies away from other projects that would provide that housing. Ms. de la Uz. testified about how astoundingly inefficient Atlantic Yards is planned to be in term of using such housing subsidies as opposed to the programs of alternative providers, the Fifth Avenue Committee being one of them. Senator Perkins commented after the hearing was over that the most important testimony was that provided by George Sweeting of the city’s Independent Budget Office. Senator Perkins noted that during that testimony “you could hear a pin drop” which he pointed out was quite something given the many people in the crowd who had come specifically to be raucous and disruptive. What we heard from the IBO was that the Atlantic Yards megaproject has changed enough so that, even though there are still further reductions that need to be taken into account in the calculated amount of benefit the project will provide, it is already clear that the reductions in benefit which are already known, identified and susceptible to calculation now “eclipse” (that means “wipe out”) the meager amount of “net public benefit” that the IBO had once been able to calculate that the project could deliver. (Technically, the calculations done so far extend just to the arena, as we noted all that will be built at first, but see the section above per the benefit of the housing and read on with respect to what we say about the zoning override.) In other words the project is NOT delivering any public benefit. Here then is our own Noticing New York testimony supplied for the hearing today. I offer this testimony as an attorney experienced in real estate, as an urban planner and as former senior government official who worked for more than a quarter of century in the areas of public finance and development for the state finance authorities. Atlantic Yards is such a spectacularly bad and indefensible project that it will take far more time than we have available for me to comprehensively lay out all its major flaws. * Instead, let me focus on three interrelated things: 1.) zoning, 2.) eminent domain, and 3.) the effect on the aforementioned two when special developer relationships are allowed to supercede proper government process. 1. First, it should be borne in mind that upzoning is the natural and conventional alternative to eminent domain when development of an area is desired. With upzoning the benefits of development in an area flow to the residents of that area. This process of development is unlikely to involve wholesale destruction and the organic nature of that process will likely provide greater opportunity to integrate the sensible preservation of historical and other worthwhile buildings valued by the community. 2. By contrast, upzoning is misused in connection with eminent domain. Atlantic Yards is a prime example (as is the Columbia University expansion) of the strong lure that exists for developer-driven eminent domain to be accompanied by significant upzonings that preferentially benefit the developer. Why? Because upzoning allows the developer driving the process to collect eminent domain windfall. Eminent domain accompanied by an upzoning redirects the benefits of the upzoning that would normally flow to the community to, in this case, Forest City Ratner. 3. Atlantic Yards, which involves a zoning override provides monumental testimony to how such a zoning override, when developer-driven, is immediately abused. You see this in the colossal density of Atlantic Yards. It is proposed to tower over its adjacent neighbors for which there is no comparable upzoning. In fact, because Forest City Ratner has with Atlantic Yards usurped disproportionate development rights, development rights that will not be available for distribution elsewhere and to other members of the community. For instance, because Forest City Ratner will disproportionately overburden the subways and infrastructure, other Brooklyn developments can’t take advantage of those assets. Because Atlantic Yards will infuse so much additional density to Prospect Heights and Fort Greene it will not be possible to distribute density to other sites in the vicinity. What planning sense does it make for Atlantic Yards to tower by many multiples over another brand new government-sponsored and -assisted project, Atlantic Terrace, which is just across the street? Why should the contemporaneously planned Atlantic Terrace stand ten-stories tall on one side of the street while immediately across it will be dwarfed by a fifteen-story tall illuminated animated sign on a building that will itself stand more than five times as tall? 4. Zoning needs to be done carefully and needs to be driven by government. The classic definition of zoning is that it is a societal compact implemented between neighbors through the mediation of government. In essence, everyone in a neighborhood agrees that they will mutually refrain from inflicting the damage of overbearing development on each other, collectively agreeing to restrain themselves to workable norms. When zoning is commandeered to be driven by a single developer, the norms by which society customarily lives cease to apply and the one-sided harm is obvious. 5. These abuses are all driven by special developer relationships that we advise you to look into. The irrationality of the decisions being made can only be explained in terms of the special relationships that are being allowed to take precedence over good procedure and governance. Therefore, when something does not make sense like Atlantic Yards’ unprecedented density or its peculiarly-shaped footprint, we urge that you question carefully and deeply the relationships that drive them. How big should an amusement park be? How do you count acres? If you didn’t have a good sense for the answer to either of these questions you might want to rely on the advice of an expert you trusted to say how many acres an amusement park ought to be. For a lot of us, that’s where the Municipal Art Society comes in. We rely on MAS’s expertise, the impartiality of their nonprofit-motivated assessments, and their time and commitment to be the first to carefully scrutinize important issues about the building of the city. When the Municipal Art Society speaks, we listen. to create a new and enhanced 27-acre year-round vibrant open and accessible amusement district. Surprise! If you favored that rezoning plan, you would be favoring a plan that proposed an amusement park area less than half of what the Municipal Art Society was recommending, a plan with only 12.5 acres of the amusement park area called for MAS. By the same token if, informed by MAS, you attempted to perform the role of a good citizen and wrote a letter to the City Planning Commission saying that you wanted to see a 27-acre amusement park area in Coney Island, the City Planning Commission might self-servingly take your letter and count it as support for the city’s proposed rezoning which MAS opposes because, once again, the city plan, at a paltry 12.5 acres, proposes less than half the minimum acreage for actual amusements at Coney Island that the Municipal Art Society said is essential if Coney Island amusements are going to survive the proposed shrinking of amusement life at Coney. Why is support for a minimum of 27 acres NOT support for a minimum of 27 acres? It has to do with a little game of terminology the city seems to be consciously playing. Something we might refer to as a “razzle” as we will further explain. It doesn’t seem like the city wants you to know what it is proposing to do at Coney Island. The city probably doesn’t want the public to know to just how small the size it intends to shrink the once-great Coney amusement area because then the public might oppose selling all those amusement acres to real estate developers and land speculators for blander uses of the seashore. 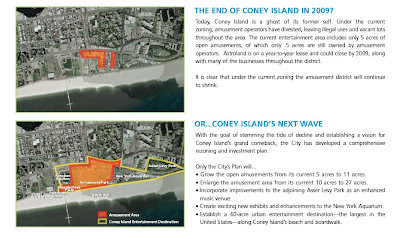 The Municipal Art Society assumed the role of advocating for the preservation of Coney Island’s amusement park area in June of 2008 after the city, in April, abruptly and unexpectedly shifted course in the formulation of its development plan to drastically shrink to a vestigial few the number of amusement park acres that would be left. (See: Wednesday, November 5, 2008, Back In the Coney Island Saddle?) The city was proposing as few as 9 acres of open-air amusements. MAS in commenting on the environmental impact statement said (supplying their own emphasis). We are not aware of any other amusement areas of a comparable scale that come close to achieving the number of visitors that is the market for a revitalized Coney Island or even Coney Island today. We are concerned that the proposed area set aside for open-air amusements is of insufficient size and that as a result this revitalization effort will not be successful. As part of the public planning process, the City has engaged in scores of meetings with a wide variety of local and citywide stakeholders in shaping its current rezoning proposal for a year-round 27-acre amusement district with outdoor and enclosed amusements. We of course welcome innovative ideas for a 21st century destination that keeps and enhances Coney Island's unique edgy character and open accessibility. However, it is imperative that the rezoning process and timeline not be jeopardized by any reconsideration of our proposed rezoning boundaries or urban design parameters. After two scoping sessions and significant public input, we expect to begin the public approval process in early 2009, which will culminate in a vote on the plan by the City Council in the summer of 2009. It is imperative that this rezoning proceed expeditiously, otherwise the Coney Island amusement area that we know and love will cease to exist. We welcome ideas about how to best design, structure and program a year-round amusement district with an open and accessible Amusement Park as its centerpiece. The primary one is to create a new and enhanced 27-acre year-round vibrant open and accessible amusement district. 27 acres? That sounds like MAS’s recommendation, but where MAS has been proposing preservation of a minimum of 27 acres of Coney’s traditional open-air amusements Ms. Kapur is proposing, though it doesn’t immediately sound like it, only 12.5. 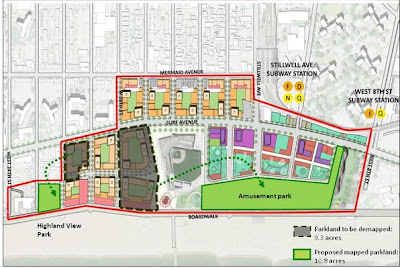 To be fair, we are told by one of the people most knowledgeable about the competing visions for Coney Island that it is possible to find a reference in city administration documents to the calculation of a 27-acre district that dates back to June 2008. 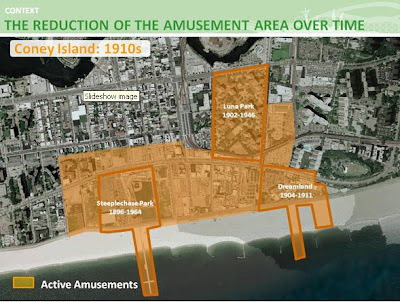 Nevertheless, what happened after MAS identified its study figure that a minimum of 26.5 acres (or, rounding off, a minimum of about 27 acres) was needed for amusements at Coney to remain viable is interesting and, we believe, very significant. The MAS recommendation was released just before Thanksgiving. Following the New Year’s holiday, on January 20th, 2009 City Planning issued its first press release referring to the fact that it planned “an open and accessible 27-acre indoor and outdoor amusement and entertainment district stretching along the famed boardwalk from the Parachute Jump to the New York Aquarium.” By referring to the open-air boardwalk and Parachute Jump and perhaps also to the aquarium which has many open-air features, the casual reader might not readily notice that “open and accessible” and “entertainment” was not referring to traditional “open-air” Coney Island amusements. The reader would be especially inclined NOT to notice the city’s intent to severely shrink the Coney Island amusement park area, given that the title of the press release included this phraseology (emphasis supplied): “City’s Comprehensive Strategy to Save and Expand on Amusements.” Very clever! It does sound rather like the expanded amusement area MAS was calling for. 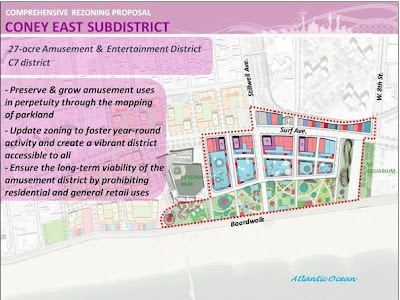 See: City Planning Begins Public Review on Rezoning of Coney Island: Part of City’s Comprehensive Strategy to Save and Expand on Amusements as Year Round Destination and Revitalize Surrounding Neighborhood, January 20th, 2009. 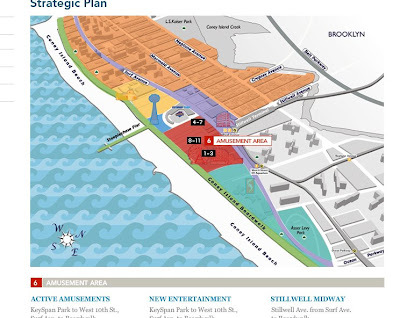 Whereas the “27 acre” figure had never previously been mentioned by a city administration press release, the Coney Island Development Corporation (CIDC) now followed suit and a slew of city administration press releases followed, regularly working in some featured mention of the city’s 27-acre concept. It apparently became a theme for the press offices promoting the city’s plan to harp on. Deputy Mayor for Economic Development, Robert C. Lieber, NYC Economic Development Corporation (NYCEDC) President, Seth W. Pinsky and Department of City Planning Commissioner Amanda M. Burden today . . . The Rocket will become a permanent and iconic part of the 27 acre redeveloped amusement district in Coney Island. The City's plan will expand the amusement district to 27 acres . . .
Deputy Mayor for Economic Development, Robert C. Lieber, and Premier Rides, Inc. President Jim Seay today announced the Coney Island Amusement Advisory Panel, a group of leading amusement industry experts that will help structure and expedite the City’s plans for interim amusements at Coney Island in Summer 2010. The panel will also assist the City in continued planning efforts for a permanent amusement operation and development of a 27-acre amusement and entertainment district at Coney Island. "Marty Markowitz shares our view that the time is now to restore Coney Island's heyday, enlarge and enhance the famed amusement district, and create jobs and housing for residents. Our plan will reverse the trend of disinvestment in the amusement district and expand it to 27 acres. As we said, it sure makes the shrinkage sound like an enlargement, doesn’t it? We thought it would be a worthwhile exercise to see how readily the 27 acres the city is talking about could be identified. In other words, when press releases (as per the one immediately above) are freely throwing around the notion that the “amusement district” will “expand” “to “27 acres,” is it just an abstract notion or is there something specific that is easy to refer to? We wanted to see the 27 acres mapped out and clearly identified. Finding such a clearly identified map of the 27 acres on the web turned out not to be exactly easy. We figured that since the administration press releases were now routinely referring to the 27 acres that Ms. Kapur and city administration officials were constantly referring to in their public appearances, the best people to call for a map with a clear reference to the map’s depiction of the 27 acres would be the press departments representing those city administration officials working on the Coney Island plan. We called the press departments for City Planing and for the CIDC. The CIDC representative referred us to the Department of City Planning’s web site (where we had not been able to find exactly what we were looking for- we provide the same link) and also said we could refer to CIDC’s own site and gave us a link to the CIDC press kit. Though we spent half of last week trying, we were never able to get a City Planning representative to identify a map clearly showing the 27 acres. After talking with the CIDC representative we got some confirmation of what we suspected, that this image (see below- Click to enlarge) on the City Planning site shows the 27 acres. Coney East, the section in Blue, is the area that encompasses the current amusements, and this is the area which will be the new 27-acre amusement district. On the other hand, it could easily have been this encircled acreage which, though similar, is not the same. (see immediately below- Click to enlarge) And we caution you that there are so many mapped versions of what land will be providing amusements that there could be all sorts of other confusion. Since an amusement area is in issue, maybe it is appropriate to describe the way the city provides acreage numbers as a sort of “Razzle” game, sometimes also refereed to as “Razzle Dazzle.” A “Razzle” is an old carney game and we understand that some of the carney amusement community people see that this is exactly what the city is doing, throwing out numbers that most people are having problems keeping straight in their minds. The point of a Razzle is, after all, that the mark playing the game doesn’t keep straight in his mind the numbers that are being thrown out by the Razzler. The numbers are meant to be incomprehensible to the mark, who is supposed to believe the Razzler’s patter claiming that a win is almost within reach, with just one or two more plays designed to empty the player’s pockets. 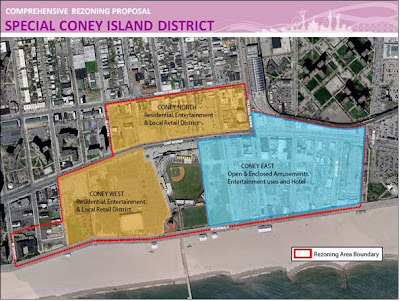 In the case of the Coney rezoning the city’s goal is to to reduce the total number of Coney Island amusement acres. Just remember that as you read further. One is an acre and half community park, which will be a neighborhood park open to the new and the existing Coney Island community. And then on the other side is a 9.3 acre amusement park which will be mapped along the boardwalk and this will become the centerpiece of the new amusement district that we are proposing to create for you. 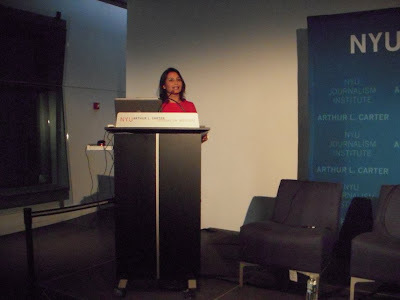 Ms. Kapur refers to the “9.3 acre amusement park” (9.39 actually) as the “centerpiece of the new amusement district that we are proposing to create for you.” “New” is an interesting adjective in this regard because while 9.3 acres of what was supposed to be preserved as amusement acreage is being de-mapped, the “9.3 acre amusement park” is not new at all. It includes the city-owned Cyclone which already sits on a substantial portion of that acreage. * It includes the Wonder Wheel and the approximately one acre of land the city has is acquiring to lease back to the family who originally owned the Deno’s Wonder Wheel for their kiddie park. What was until a few months ago Astroland won’t be “new” amusement area under the city’s plan, but it is almost as if the developer/land speculator Joe Sitt (Thor Equities) has been working with the city’s PR people to promote the rezoning plan (totaling 47 acres in all) because Sitt’s eviction of Astroland from its 3.1 acres last fall makes it easier to argue that the city is fighting for more amusements than would otherwise be there given the recent Astroland eviction. Below is an image showing how small the city’s actual proposed amusement park area will be. We obtained this months ago from the CIDC at a Municipal Art Society event and included it in one of our posts. (We are not sure that it is any longer available through the CIDC.) Use the Cyclone and the Wonder Wheel as a reference for scale and you will note how little land is left for any similarly major amusement rides. Here is another comparative reference: Coney’s existing New York Aquarium is 14 acres. Based on the acreage resources devoted under the city’s plan, future New Yorkers are more likely to think of going out to Coney for the 14-acre aquarium than for the 9.3-acre amusement park. In fact, the aquarium is sometimes considered a coordinated part of a 22.3 acre area (the Hennessey Triangle) consisting of the aquarium and the 5.3 acre Asser Levy Park (Seaside Park). There is also the 1.8 acre Asser Levy Recreation Center, Pool and Playground. for the 38 days that it is in season and there is a game going on there. For most of rest of the year they remain vacant or very sparsely utilized. Here is an interesting Razzle Dazzle question: Since the 2.2 acre Steeplechase Plaza immediately abuts the “27-acre amusement district” why isn’t it and its acreage included in the city's official amusement district so that people would then be talking about a 29.2 acre district? 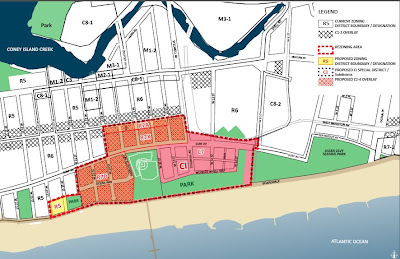 The 27 acre amusement district consists of a new park we are mapping which, when combined with the Steeplechase Plaza on one side and the existing Cyclone on the other, is twelve and a half acres of parkland that then becomes a beachfront amusement park. Complementing that is area to the north which is also amusement area and is being zoned through a special district to allow for a range of open and enclosed amusements, rides, but also bringing in uses such as restaurants that are not permitted here today, movie theaters, water parks, Imaxes, and also hotels that would be limited to the Surf Avenue frontage, also limited to locations in the corners. Forewarned is forearmed. See if you can withstand this: Everything we have written above should make clear that the city is selling a reduction and near elimination of amusements at Coney- But, even knowing that, don’t the following descriptions by Ms. Kapur at the NYU symposium make it sound like something completely different? One is an acre and a half community park, which will be a neighborhood park open to the new and the existing Coney Island community. And then on the other side is a 9.3 acre amusement park which will be mapped along the boardwalk and this will become the centerpiece of the new amusement district that we are proposing to create for you. The way we have strategically located this park property, it starts to create a network of parks starting all the way from Ocean Parkway, through the boardwalk to Asser Levy Park to the New York Aquarium, the new proposed amusement park district, the Keyspan Park and then finally ending in Highland View Park* which is the new neighborhood park we are proposing to create. This is a network of 60 acres of active amusement, entertainment, publicly accessible areas within the Coney Island system. And alongside the beach which is more than a hundred acres here and the three-mile-long boardwalk this really starts to create a nexus which becomes the amusement and entertainment center. So how exactly would this amusement district work? The 27-acre amusement district consists of a new park we are mapping which, when combined with the Steeplechase Plaza on one side and the existing Cyclone, on the other is twelve and a half acres of parkland that then becomes a beachfront amusement park. Complementing that is area to the north which is also amusement area and is being zoned through a special district to allow for a range of open and enclosed amusements, rides, but also bringing in uses such as restaurants that are not permitted here today, movie theaters, water parks, Imaxes, and also hotels that would be limited to the Surf Avenue frontage, also limited to locations in the corners. Whereas the city’s statement about what it wants in terms of amusement acreage have gotten progressively more challenging to understand, MAS has tried to simplify what it is saying, but look at the unfortunate result. MAS recently decided to round off, when stating to the public, the 26.5 figure for the minimum amusement park acreage it is calling for. You could round 26.5 to either 26 or 27 since it ends “.5" though common method rounding would have you round up to 27. Also, since the figure stated is a “minimum figure” that is another reason to round up. 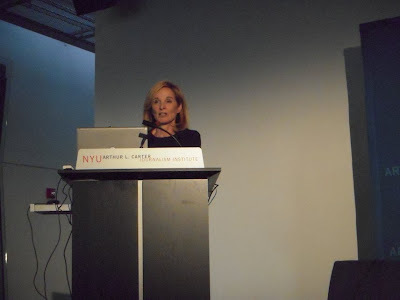 In actuality, MAS was, for a time, generally rounding the figure down to 26 in its public discussions and, more recently, has rounded down to the nearest 5, stating, for instance at the NYU symposium, the minimum acreage figure should be “25 acres.” Still, it is important to remember that MAS is calling for what is the bare minimum of what it thinks is a viably sized amusement park area. Almost every other premier amusement park around the world is substantially larger. 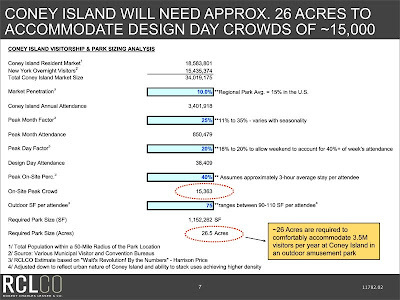 The ironic effect of MAS’s simplified rounding down of its figure to 25 acres is that this number, while more clearly distinct from the city’s “27-acre amusement district” now appears to be calling for less than the city is calling for, even though MAS is actually calling for an open-air amusement area more than twice as large as what the city is calling for. Give yourself a pat on the back if you are following all of this. It certainly means that the press has had an uphill battle in expressing things clearly. We said at the outset that we don’t believe the city wants you to know what it is proposing to do at Coney Island. 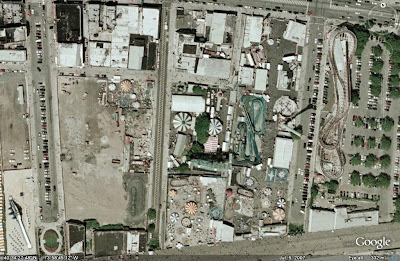 We don’t think the city wants the public to know to what a tiny vestigial remnant it intends to shrink the once-great Coney amusement area because then the public would almost certainly oppose the selling of all those amusement park acres. Isn’t the city growing? Why then should the city be eliminating the resource of a great amusement park? Why should the city seemingly be doing everything in its power to see that a historic amusement park is sold off to real estate develop developers and land speculators for blander uses of the seashore less accommodating of the public or our imaginations? The Municipal Art Society called for the a minimum of 27 acres of traditional style amusements at Coney: We think the city’s somewhat sneaky rejoinder to MAS’s recommendation speaks volumes. When someone confuses the issue and doesn’t take a debate on squarely and directly we think it is a fairly good indication that they know they are on what should be the losing side of an argument. 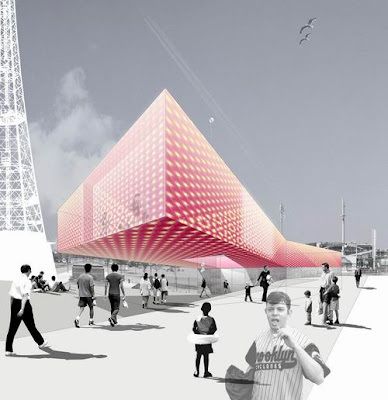 By the way, those alternative replacement uses the city envisions substituting for Coney’s amusements may be generations in coming even if the amusement area is put asunder now . . . But that is material for a future Noticing New York post.